Chennai, Apr 18 : Union Chemicals and Fertilisers Minister M. K. Alagiri on Monday alleged that the Election Commission is acting against the Dravida Munnetra Kazhagam (DMK) party, with the aim of causing its defeat in the Assembly elections. Talking to reporters at Chennai Airport, Alagiri said: "The Election Commission is trying to defeat the DMK and is working against the party. "As I said earlier, the Election Commission had worked in such a manner to ensure that we are not back in power," he added. 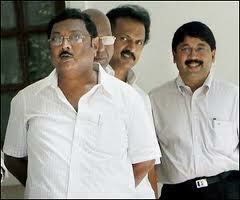 He further said the DMK would definitely come to power, this time as well. Currently, the DMK and its alliance partner Congress party are ruling the state while the main opposition is All India Anna Dravida Munnetra Kazhagam (AIADMK). The Assembly polls in Tamil Nadu concluded on Wednesday along with the Kerala and Puducherry. Tamil Nadu registered over 70 percent of turnout in the polls.